DIXON, Calif. /California Newswire/ — Moller International, Inc. (OTCMKTS:MLER / OTC:MLER) is again offering to sell its original M400 Skycar(R) via public auction as a centerpiece of any car or aircraft collection in a public or private museum. It is the world’s first true VTOL (vertical takeoff and landing) “Flying Car” to be demonstrated. It is very prevalent on Google and YouTube under M400 Skycar. The “aerocar” has been relisted at a more reasonable starting price. According to the company, “The M400 Skycar is a true museum piece, developed over many years and first flown in 2001 at the company’s shareholder meeting. It has since flown (under a restricted environment) many times.” This vehicle was featured on the covers Popular Science, Popular Mechanics, and the topic of countless news articles and broadcasts including 60 Minutes, ABC, Bloomberg, CNN, and Discovery Channel. A collector who buys the M400 Skycar(R) will receive it in its original 2001 flight form and condition, complete with eight Rotapower engines that produced over than 720 hp allowing the M400 Skycar(R) to take off and land vertically. It should be noted, however, in this original form, it was not FAA approved and a condition of this sale is that it cannot be flown. Nonetheless, this vehicle can be the centerpiece of any car or aircraft collection in a public or private museum. Reassembling it back to its original state will take some time. Over the last 30 years, Moller International has spent more than $150 million developing the engine and airframe technology to make this prototype possible. 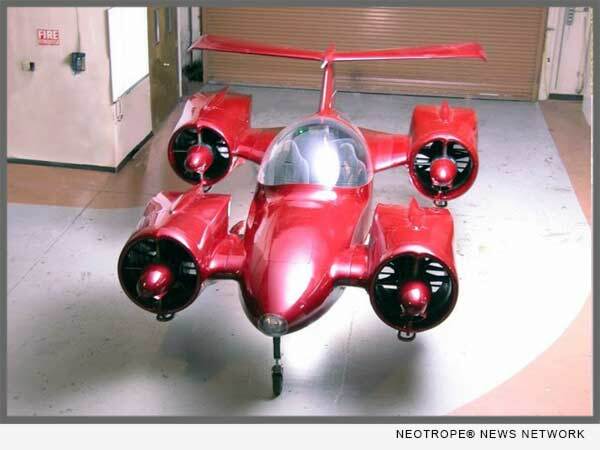 A modified version of the original M400 Skycar(R) was previously offered for sale, but failed to meet the reserve. The M400 prototype has now been superseded by the hybrid Skycar(R) 400 configuration. View more information about Moller at: http://moller.com/. Upon successful completion of this auction, Moller International will immediately transfer title to its new owner. A bidder that is first qualified by eBay is invited by Moller International to inspect the M400 Skycar(R) during the auction.